My daughter has a Brazilian week in her class. I have no idea what this means, but she took her brother’s Brazilian soccer team shirt to school and she asked me if I could make a CD with Brazilian music. I don’t really like to listen to typical Brazilian music, and especially not to samba’s. I guess that I am not subtle enough for that kind of rhythms. I prefer more simple ones, as you probably will have noticed if you are a regular reader of this Soundtrack. But I don’t want to disappoint my daughter, so I did a search in my Wall of Records and made a compilation with Brazilian music for her. Including all the obvious songs, like Masque nada And Aqua de beber . I was surprised how much Brazilian music I have, considering the fact that I don’t even like it. Unfortunately, most of this music is not what my daughter asked for. But maybe I can please some of the readers of this Soundtrack with what I found. Like the CD that I got from Marthy Coumans. 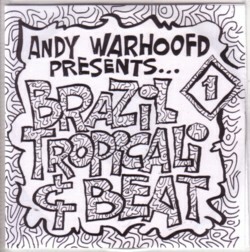 He compiled a CD with obscure Brazilian 45’s from his amazing collection for me. He sent the tracklist over the mail, but that got lost when my computer died.